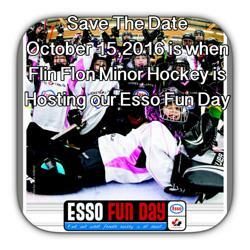 On October 15th we will be hosting the Esso Fun Day for all our girls currently in Hockey and any New Girls who would like to try it out. Our on ice session is at 11:30 on October 15th it will be run by the MIDGET AAA Coach, and it will be followed by a yoga session. All girls participating will get a jersey and some other Goodies. If you could please share this info with anyone else you think might be interested the more girls we have the better.